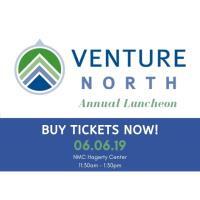 Please join us for the Venture North Annual Luncheon from 11:30am – 1:30pm at The Hagerty Center in Traverse City! Network with fellow business and community leaders, learn how we are driving economic development in Northern Michigan and enjoy lunch featuring a few client products. Hear from TraverseCONNECT’s new CEO, Warren Call, about the organization’s evolution and the results of a strategic evaluation process to push new limits of economic and community development and collaboration.